Penny was hurt during practice Monday and flew to Philadelphia for surgery, which is expected to sideline him for 3-4 weeks. Rashaad Penny, the Seahawks’ first pick in the 2018 NFL draft, suffered a hand injury that includes a broken finger during a pass rush drill in practice on Monday, coach Pete Carroll said Wednesday confirming earlier reports. But Carroll said Penny may only be out a couple of weeks after having surgery in Philadelphia performed by noted hand surgeon Dr. Randall Culp, who also did surgery on Mariners’ second baseman Robinson Cano earlier this year. Penny was the 27th overall pick out of San Diego State and represented only the third time Seattle has drafted a tailback in the first round, the others being Curt Warner and Shaun Alexander. Penny left Monday’s practice midway through. “He was in a pass rush drill and just caught his finger,” Carroll said. 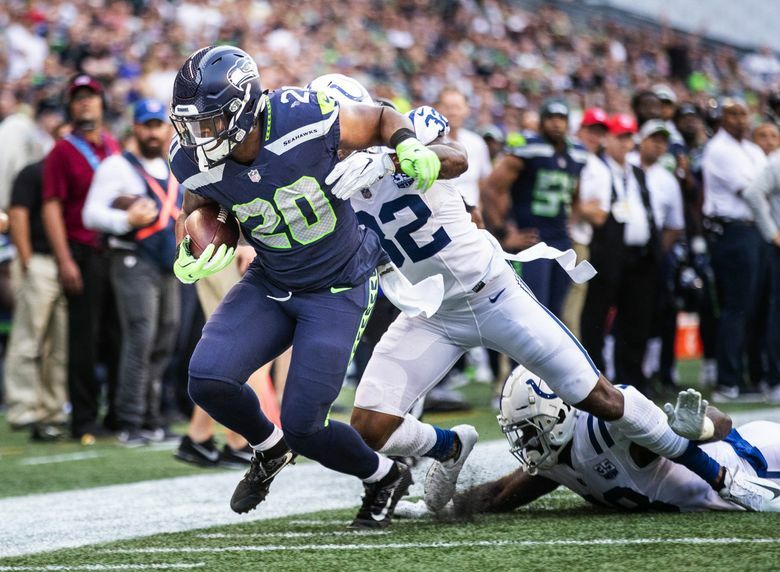 Penny had 16 yards on eight carries in his NFL preseason debut Thursday in a 19-17 loss to the Colts working as the number two tailback behind second-year player Chris Carson. With Penny out, the Seahawks will need others to step into the backup role behind Carson. Mike Davis, who was Seattle’s leading rusher as a running back last year with 240 yards, has been listed as the number three tailback behind Carson and Penny. Davis has been thought on the bubble to make the initial 53-man roster. Davis, though, also missed practice on Wednesday with a sore big toe and Carroll said it was uncertain if Davis will be sidelined longer, or for how long. Prosise, a third-year player out of Notre Dame, also missed the game against the Colts with a hip flexor injury but was expected to return to practice this week with a chance to play on Saturday against the Los Angeles Chargers in Carson, Calif. Both Prosise and McKissic have typically played more of the team’s third-down/two-minute back role, though Prosise has also been used at times as an everydown back. But Prosise has battled injuries throughout his two seasons in Seattle, playing in just 11 of 32 regular season games. His spot on the team’s 53-man roster this season seems far from guaranteed if he cannot stay healthy. However, if he makes it back, and with Penny out, he is another who could take on a larger role. Holmes played at Michigan State and signed with the Seahawks last week before the game against the Colts and did not have a carry in the game against Indy. But he also would figure to see more time going forward. The 6-1, 231-pounder started five games for Michigan State last season with 287 yards on 79 carries.